Discussion in 'Reviews and Tests' started by jasonX, Mar 21, 2017. Computer security. This has been a stale discussion/debate since viruses have been spreading from all corners of the globe in this digital age. What is your computer setup? Better yet, what is your computer security setup? Most usual answers would be his/her realtime security program such as the antivirus and firewall. Half of those who are and have been exposed to security discussions would add second-opinion antimalware applications, anti-executable/HIPS program and the like. About a fraction would state his backup solution and encryption software and the like. And the discussion goes "on and on and on...”. But what do you use computer security for? Definitely the word "PROTECTION" or "DEFENSE" will be a resounding answer! Anyone else that would say or even state a context not related to "protection and defense" is a half-wit. Going further comes the question...what are you protecting/defending? Definitely it'll be your "system" and "data"! Both "words" intertwine in this digital age. Protecting an individual's system and data entails the user or individual's behavior and the choice of applications that will help him/her get the best protection! (I remember a linux cd from a well-known computer security software stating "Defend your data"! --yeah definitely correct there!). There may be differences in the word "data" since (as stated) it will be on the context of the individual user. Data maybe "confidential" in nature and you would not want others to just see it without authorization. Financial information such as your credit card, social security number, bank records that could pave the way for identity theft. It may come in the form of --in the context of a group or company documents/files that contain, say, trade secrets, operational /organizational information and the like. Some data may also be "sensitive" to you personally and may come in the form of personal secrets/information --individual privacy. You as an individual would definitely not want to lose it. To some, like me, my personal data is the most valuable thing on my system/network. It should (imho) must be the first and foremost priority to be considered protecting/defending. Why do we have such system/computer in the first place? Almost all have it to store data/information conveniently in digital form aside from their different reasons for having a computer system/gadgets. Store/retrieve data from it for whatever purpose they deem their system/gadget is for. Why should this be a first priority? Well simply put, the OS or your operating systems and applications can be reinstalled, but your data, when lost, may be irreplaceable. Sensitive data/information, even if they can be restored via backup, when exposed, may cause unrepairable damage to you or your group/company. There have been more than a handful of data leakage stories that have caused irreparable damage to their owners and entities that moving on, or even curing it, proves very difficult. Having a layered defense/protection in your system is always best, but protecting the "files" themselves gives you more security and leverage. Yes, those "files" which contain the sensitive/confidential data. In that approach your data, whether it be confidential or sensitive, will likely to remain safe even if your layers of defense prove to be insufficient/inadequate. There are several programs and applications (freeware/paid) that can be used for this specific purpose of protecting the files which contain your sensitive/confidential data themselves. I have been using encryption via TrueCrypt since around 2004 and relied on it for the better part of my computing years for my confidential files. Transferred to AxCrypt/AES Crypt and VeraCrypt when the TrueCrypt has been discontinued abandoned. I have been on the hunt for a suitable replacement (but not that eager to find one since I am happy with my encryption approach) and there has been a lot of applications that are touted as good replacements. 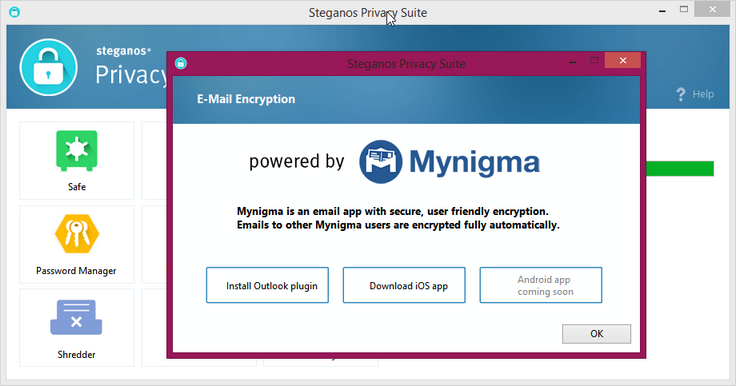 One such application is Steganos Privacy Suite. This is a review based on a "new user perspective" and trial usage of Steganos Privacy Suite 18 (SPS18) in the hope that the reader can see/understand how SPS18 can be of help to him as an individual user to protect/defend the sensitive/confidential data in his system. So let's get it on! 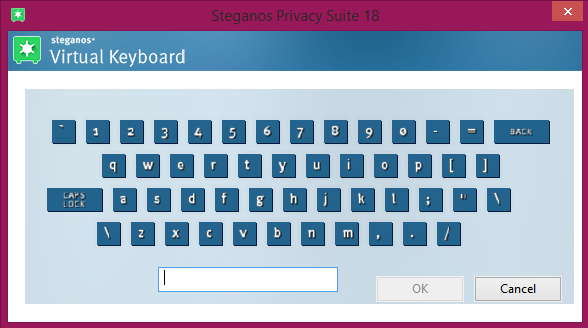 Steganos Privacy Suite 18 (SPS18) is a collection of tools designed for a specific purpose --to keep data you deem as "sensitive/confidential" safe from unauthorized access and exposure. The individual user will have the capability to encrypt/hide his data alongside cleaning traceable items from your browsers and system applications and permanent deletion/elimination of files/folders. As most of the software developers and vendors now do, Steganos offers SPS18 in an online installer package which is just below (sss18int.exe) 3mb in size. You can get an offline standalone installer via request from support or its developer. It is a <59mb download (sss18intdle.exe --see end of review for official offline download link). As most applications in the market, you can try it out for 30 days without "any" restrictions to its capability/features also. Installation of the offline package was fast and under 2 minutes and at the end of the install it will show a window where you will be asked either to buy, supply your serial number (if you have). If you want to just try it out for 30 days (without restrictions) you can just hit "Not now" and you will be taken to the user interface where you can begin your setup SPS18. Note: If you try it out for 30 days, a pop-up (nag screen) shows everytime you start SPS18. Just click "Not now" to get to the main interface. In the right column of the screen shows 5 categories of security level which gives you an "overview or status" of your security level as you set SSP18. A green checkmark will appear at the beginning of a category to signify that you are in fact using it. An unchecked (without a green check) category signifies that you are still not using it and from there you can click it to setup that category to further increase your security. Settings for display or hide "Hidden Messages". Set Language settings (currently SPS18 has support for only German, English, Spanish, Portugese and French). Start options to either start SPS18 automatically on log on (with minimized start) or set it to start manually. Shows two options to either (a) Display visual cues which will make it harder for screen grabbers to capture what keys you press (default), and (b) Shuffle keys randomly each time you press the keys which offers more security. Let's you set either to randomize the pictures for password request or not. Default setting is "randomize pictures". 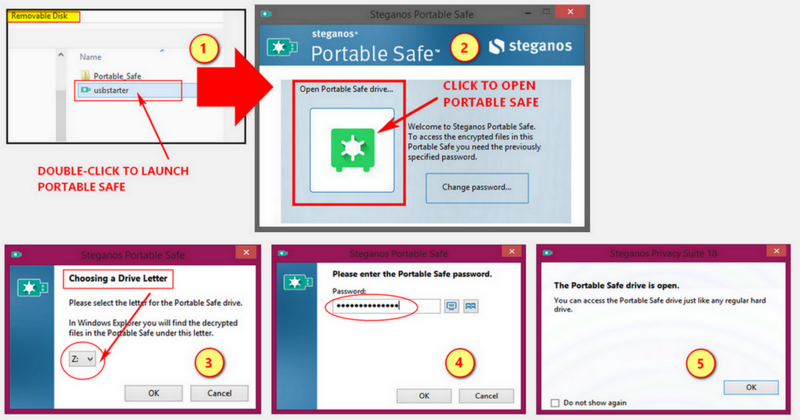 Steganos Safe is the secure drive that you will create to store your sensitive data. It is used like any other drive in your system. You can either save, edit or delete files inside your safe. To setup a Safe for your sensitive data, you can either go to (a) in the "Privacy Advisor" area click the "You do not have a Safe for sensitive data" or (b) directly go to the icon of "Safe". The Safe assistant (step-by-step instructions) will guide you through the creation. 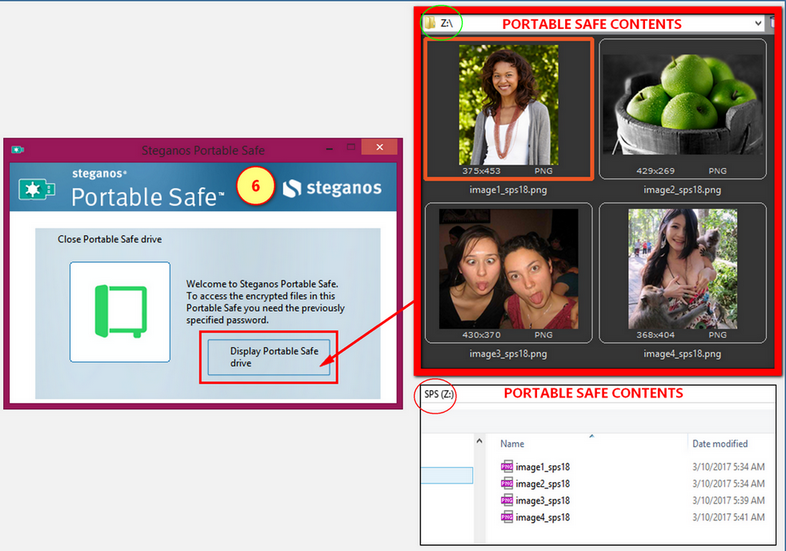 In the Steganos Safe window, go to the Create a new Safe> click the (+) sign there. A mini-pop-up will open where you can either select "create" or "import". Since we are about to create our first Safe we will select "create". Note that this is a "stationary safe" and can be used only via accessing SPS18. (1) Safe (stationary safe -- can only be accessed via the program SPS18). (2) Portable Safe -- which by its name "portable", is a Safe that can be either in an external drive, USB or CD/DVD. (3) Cloud Safe -- which is an encrypted Safe via Dropbox, Google Drive or MS OneDrive. In creating a stationary Safe, the Safe assistant (step-by-step instructions) will guide you through 6 steps. (3) Specify where the Safe file will be stored in your system --file path. (4) Specify the size of your Safe, either by the slider provided or you can type in the "Size in MB" box. You are also given the option to set your Safe to grow dynamically as the need arises. (3) Use PicPass to either use a photo or symbol as password. Anyone of us has in one way or another have memorized their passwords to some encrypted file or anything that require us to use a password (or in the case of ATM cards the PIN#). That is generally the most human thing to do "memorize it/remember it". But with that you are limited to securing "your password" as you will be kept in a bind so you'll make one easy to remember often. You can write it down but there also lies the problem that it isn’t secure as well as you might misplace it or lose it and their goes your password. A good password should be at least consists of 10 characters with special characters but then again the problem is there, "memorize it/remember it" or "write it down". Some use phrases which in fact will produce more than 10 characters. Some abbreviate those words in those phrases they use and insert numbers and special characters. It is really a trial and error and it is up to you to find that "balance" of creating a "secure password" which is simple to remember/memorize but is not as easy to crack (with the 10 characters with numbers/special character usage). There are password generators that can do the job for you. This is much more secure as it is generated via random combination of characters unlike if we are the one to "generate" it on our own we tend to use words that are rather familiar to us. Through a password generator and it's usage of absolute random combination of characters a high level of security is obtained. As seen in the previous image SPS18 offers different password options. 1) Enter/type you own password via the Virtual Keyboard. 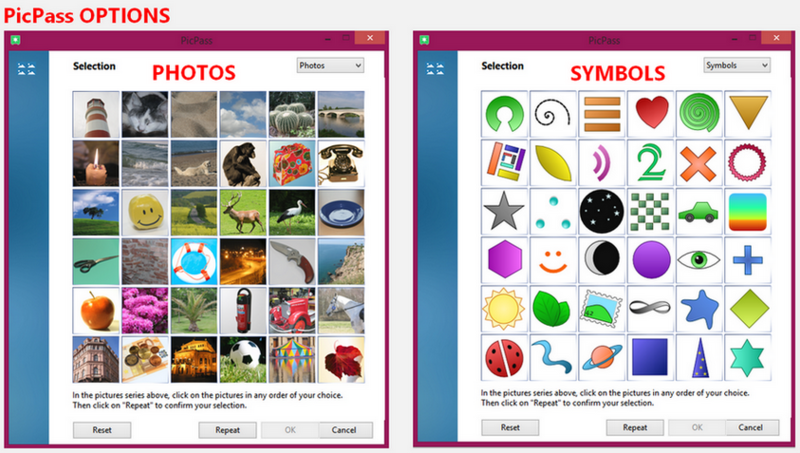 3) Use PicPass which uses a combination of either "photos" or "symbols" to generate a password. a) "uncheck" -- Display visual cues when a key is clicked". Thus the visual movement of the virtual keyboard as you click a key will not be seen thus preventing screen-grabbers to see what keys are getting clicked. b) "Check" -- Shuffle keys randomly each time the software is started". This provides additional protection from "click-grabbers" as the keys are shuffled (as the word implies) are randomly to no distinct location of each key is alike. See images below. SPS18 default number of characters for a generated password is 16. You can however specify your own in the input field. There are checkboxes that are "checked" by default, (a) Use lowercase, (b) Use UPPERCASE, (c) Use numbers. To have a more secure password generated you can place a check-mark in "Use special characters". The quality of the password from the properties that you have set will be displayed by a "status bar". After that a window will appear instructing you to place/move the mouse pointer inside that window to generate random data. Said window will close when it is finished generating the password. As it finishes a pop-up box will show you the password generated "hidden". You can either click the "display" button so you can see it or directly copy it to clipboard. That same generated password will be automatically placed in the first field. You will have to supply the generated password in the second field (so you have to copy and paste it from the clipboard). A window will appear after you have supplied the both fields. It will also show a progress indicator complete with an explanation of how secure the generated password is. See image below. PicPass provides either the use of a series "photos" or "symbols" to generate a password. These picture or symbol series are to be selected or "clicked" in the order of your preference. There are two (2) sets that you need to accomplish. First set is where the "photos" or "symbols” appear colored. When you select or click a "photo" or "symbol" in the first set it will be faded and will show a number at the upper left-hand corner of the "photo" or "symbol". Click "Repeat" button at the bottom of the window to get to the second set. You will have to repeat the sequence that you did in the first set to get a match. Think of it as the two (2) password fields in "generate random passwords". Both fields should match. In this second set (confirmation) the "photos" or "symbols" are grayed out. As mentioned you will have to repeat the sequence that you did in the first set to get a match. As you click on to complete your sequence, the "photo" or "symbol" you select will be colored with a number at the upper left-hand corner. Click "OK" to finish. A pop-up showing your "hidden" generated password from the sequence of “photos" or "symbols" you did. Same as before the "eye" button displays the password generated and beside it, the "clipboard" button to save the generated password to clipboard. SPS18 recommends at least 6 "photos" or "symbols" selected to form a sequence but it is advisable to combine it with special characters to highten the password quality. A Safe is a virtual drive in your system and functions as an additional HDD. It is used like any other drive you have in your system. When a Safe is "open" a new drive is added to Windows Explorer. You can launch programs, create directories, save, edit and delete files in your Safe. You can copy/paste or drag/drop items in your Safe. When files are added to a Safe it is automatically encrypted in realtime. When "closed" your data is protected and the added "new drive" disappears in Windows Explorer. You can create a "Portable Safe" either from an flash drive, an external drive or a DVD disc. Anything that is portable are accommodated. One thing to note is that the maximum size for creating a portable safe in FAT32 is 3.99GB. To accommodate a bigger capacity the drive should be in NTFS file system. All files are secure in your Portable Safe and if ever you lose your portable device, say, flash drive/usb stick, unauthorized access is blocked because of its encryption. One thing to be noted is that the Portable Safe cannot be launched in Windows NT 4.0 or Windows 95/98. To create a portable Safe (flash drive), you have to go to "Safe>Create a Safe>Portable Safe". The next window will allow you to select the portable device you prefer. The 3rd step is to set the allocation capacity for your portable Safe afterwhich the next window will ask you to enter a password. Take note as in the creation of the "stationary safe" there are 3 options to enter a password (via virtual keyboard, password generator or PicPass) alongside the "password quality indicator" which informs you of the password entered. The next window will let you specify the drive letter that will be used to mount your portable Safe. Upon creation, the portable Safe will be "mounted" (as specified by the drive letter you selected) and "open" so you can add files to it. For this I chose to add some image files namely, image_1.png, image_2.png, image_3.png and image_4.png. The portable safe contents are display below. You can close the Portable Safe by clicking the Safe icon in the window in step#8. See images below. 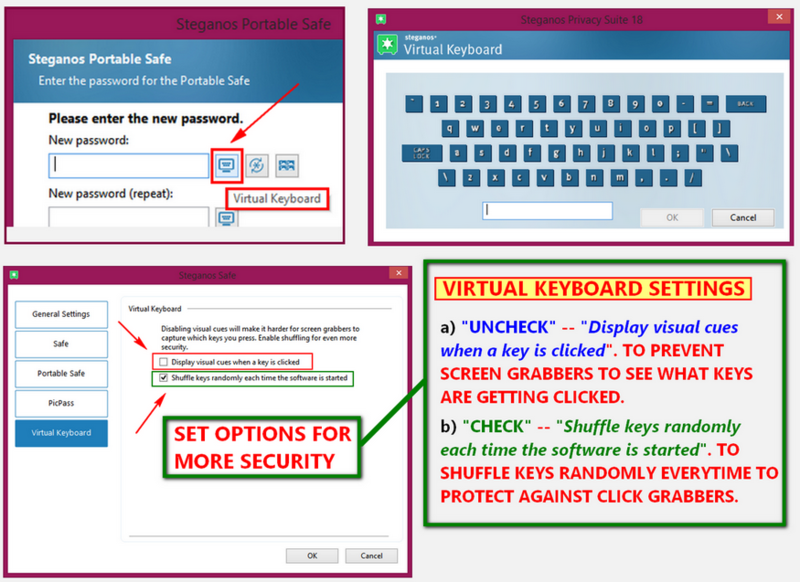 To "open" a portable Safe, say, a portable safe in a flash drive, you have to plug-in the flash drive and select "usbstarter.exe" (step#1) afterwhich the Portable Safe window will appear where you can click the "closed Safe" icon to proceed to "open" the portable safe. Ste#3 lets you specify the drive letter where the safe will be "mounted" in Windows Explorer afterwhich you will need to supply your password and then that's your portable safe is "open"! A safe can be "hidden" in a video or audio file as well as within an executable file. SPS18 attaches the Safe to a video or audio file and you can play the audio/video file after hiding a Safe. The formats supported are .mp3, .m4a, .avi, .mpeg, .mov and .exe. In order to hide a Safe in this method your Safe should not exceed 3GB. Hiding is done by going to Safe>Hide from the context menu. The pop-up wizard will then ask for a "carrier file" (file with which you will hide the Safe). After you have attached a Safe to that carrier file it is removed from the main screen interface of Steganos Safe. That actual Safe now resides "inside" that carrier file. Let it be noted that the original files are not deleted. To open the Safe that you have hidden, go to Safe>Open Hidden Safe. Select the carrier file that you have selected previously and enter the password of the Safe. The Safe will then be added as a drive in Windows Explorer. The wizard (window) will stay open until you choose to close it. To create a cloud Safe you must have the application installed in your system with it's connection to the it's cloud account. Currently supported cloud storages are Microsoft OneDrive, Google Drive, and Dropbox. Go to Create a new Safe>Cloud Safe. Specify the cloud provider you use and follow the wizard for you to set it up. Once created the application, say, OneDrive will synchronize the Safe file (.sle) with your cloud storage. Full synchronization allows you to use it on different PC/system as long as the both Safe program and cloud application is installed/synchronized with your cloud storage account. Let it be note that currently only Dropbox supports selective synchronization of recent file changes so for cloud storages not supporting "selective synchronization of recent file changes" (OneDrive and Google Drive) it is advisable to use "small Safes" because whenever the content of the cloud Safe changes, the "whole Safe" will have to be synchronized again/altogether. As recommended by security experts we should do backups of our data. This is always sound/sane decision because data, while we use it, are susceptible to damage and corruption as well as physical components such as HDD's can fail unexpectedly. Thus aside from your system it is (again) a sound decision to have a backup outside of your system perhaps in a portable/external device. Steganos also advocates that and it's pretty simple to backup up a Safe you created. 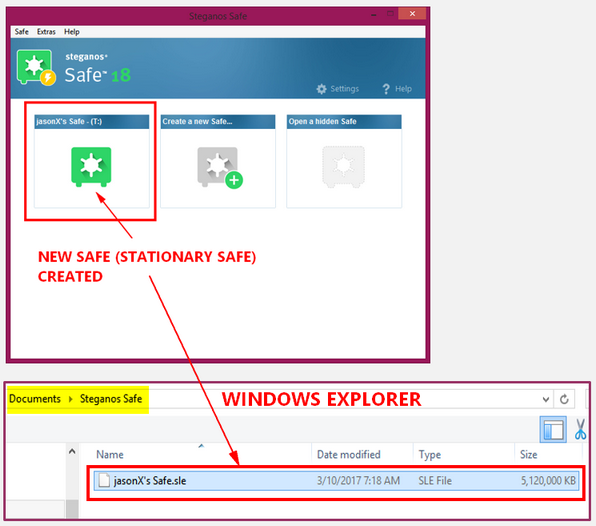 Backing up a Safe can be done by going to "Safe" and right-clicking the "safe icon" and choosing "Change Location"(Safe>Change Location). There you will see the location settings of your Safe. You just have to open the file location via the Windows Explorer and copy that .sle file of yours to a a location of your choice, say, an external/portable drive. See image below. Let it be noted that in SPS18 you can backup a Safe up to 2TB in NTFS file system and up to 4GB in FAT32 file system --same as the conditions when you create a Safe. So for FAT32 file system you are limited there. I learned it the hard way when I tried to backup "jasonX's Safe.sle" to a 14Gb empty flash drive. That "condition" I later found out was specified in the online help file. Kindly see "Observations" in the end part of this review for further details. omidomi, aviator365, ant_gamal and 5 others like this. You can "import" your backup copy from that backup location. Previously I backed-up jasonX's Safe (5.12GB) to a Seagate Backup Drive. So to import that same backup of that particular Safe go to Safe>Create New Safe> click "Import". You will be asked to specify the location of the .sle file that you want to import. In this case it is the Seagate Backup Drive (location is K:\Steganos Trial\Safe1) where I backed-up "jasonX's Safe". See image below of the successful importing of the backed-up Safe. I also made a backup of "jasonX's Safe2" in a flash drive (14GB FAT32). In Safe>Create New Safe> click "Import". You will be asked to specify the location of the .sle file that you want to import. In this case it is the flash drive where I backed-up "jasonX's Safe2". Administering or managing an existing safe can be done in each unique Safe. You have to make sure that the safe is "closed" and then right-click on the "safe icon" of an existing safe you want to manage a setting. Option#1 (Safe) is where the description of the safe is seen. Settings pertaining to "color highlight", drive letter specification, password change, mounting (as local or removable drive) and its protection using the same password it is under for any changes to the safe's setting. Option#2 (Location) is where your safe (.sle) file is located. From here you can move your Safe).sle file) to a new location or just display it for when you want to backup the very same .sle file to an external location (please also see Backing-up your Safe). Option#3 (Events) is where you set the Safe's behavior on certain events such as: (a) Behavior of a Safe when you log on to your computer, (b) When a screen is locked /or screen saver has been activated or another user las logged-on, (c) Behavior of the Safe during stand-by mode or hibernation mode, and (d) Shortcut creation when a Safe is "opened" (disappears when it is "closed"). 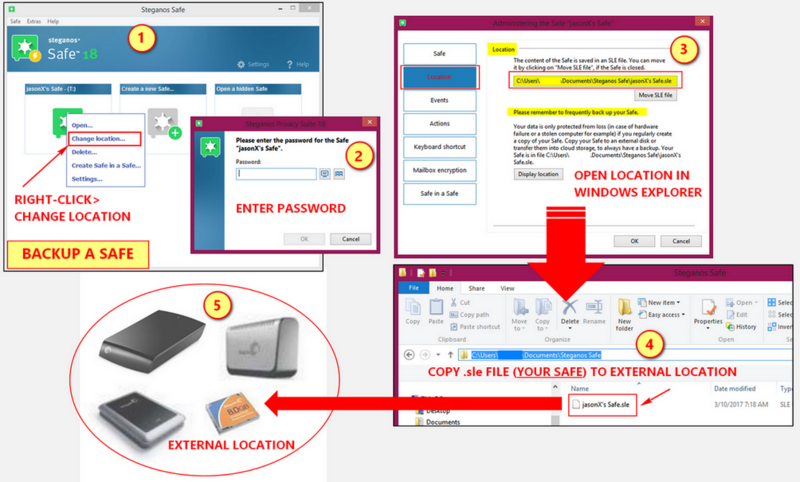 Option#4 (Actions) is where certain actions are set when a Safe is either, (a) opened, (b) closed, (c) what action is done when a Safe automatically closes as well as, (d) action of Safe if displayed or not after it's opening in Windows Explorer. Option#5 (Keyboard shortcut) where you set a keyboard shortcut for your Safe. Option#6 (Mailbox encryption) -- NOTE: SPS18 does not support email encryption on x64 systems! Option#7 (Safe in a Safe) where you can create a Safe in an existing Safe. Something like a hidden volume or container (like in TrueCrypt/VeraCrypt). SPS18 can encrypt/decrypt and hide sensitive documents you have and keep them safe from prying eyes. It allows you to create encrypted archives for safe storage of documents, files etc. To create a new archive go to Crypt&Hide>Add file or Crypt&Hide>Add folder. Provide a description of the added files/folders in the text entry field for proper documentation and as guide. When you have added all the files/folders you prefer just click on "Save as" and specify a location for your encrypted archive. Specify a "name" for that archive and location where it will reside. Enter a password for that archive. Click "OK" to finish creating the Crypt&Hide archive. After creation of the archive it will disappear from the Crypt&Hide interface. To open files/folders that you have placed inside an encrypted archive in Crypt&Hide just click "Open" button and select the file to be open/decrypted then click "Open". For files that you have hidden inside an image/audio file, you need to select the file format you have used, enter the password and then click "OK". Extracting files or multiple files from an encrypted archive you have to select the file/s and click "Extract files" button, select the location where you want it extracted (or in the case of multiple files, highlight the files you need extracted) and click on "Save". You can delete/remove a file/folder in that archive by just highlighting it and clicking "Delete>OK". Save any changes you did. The "Share" button allows you to "upload" an encrypted archive to your cloud storage directly either in Dropbox, Google Drive or OneDrive. It will be uploaded in its encrypted form so your cloud provider cannot access its contents. As with "hiding" a Safe in a video/audio file, Crypt&Hide also allows you to hide an encrypted archive in an image/audio file provided that the carrier file (which is the image or audio file) is 20x larger than the encrypted archive. If by chance that the file carrier file you chose is "small" Crypt&Hide will remind you to use a bigger sized file. Do make sure that you create a "copy" of the original file (carrier file) before you proceed to hide an encrypted archive in it. Supported files are .jpg, .bmp, and .wav. Encountered an error during this attempt. See images below. This is further mentioned in the Observations. Hiding a file in an image proved to be successful. No errors encountered. Same procedure as you will need to click "Add File" and browse to location of your chosen file to be hidden and click "Open"(in this case, "File to hide_txt_in_image - Copy.txt"). Selected file to be hidden will added in the interface. To hide it just select it (file to be hidden) and click "Hide". Select the "carrier file"(in this case, 1973921.jpeg) which will be used to hide "File to hide_txt_in_image - Copy.txt". 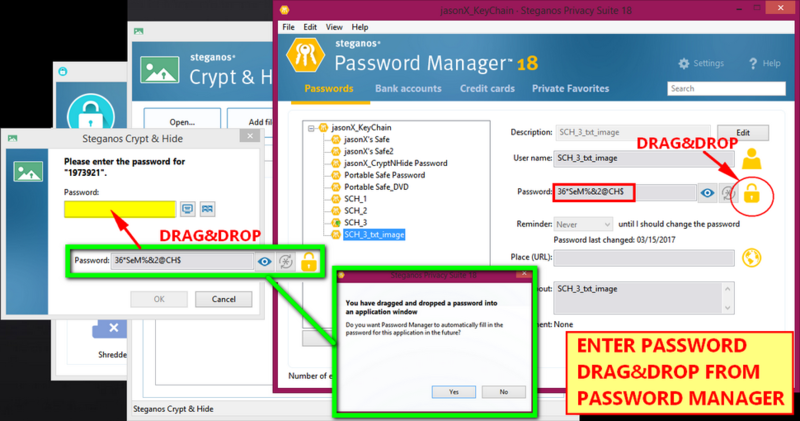 Set appropriate password (in this case, password was saved in Steganos Password Manager keychain file) Drag&Drop the password in Steganos Password Manager via the "padlock icon". As the password is "dropped" in the password filed of Crypt&Hide a pop-up opens asking "Do you want Password Manager to automatically fill in the password for this application in the future?" 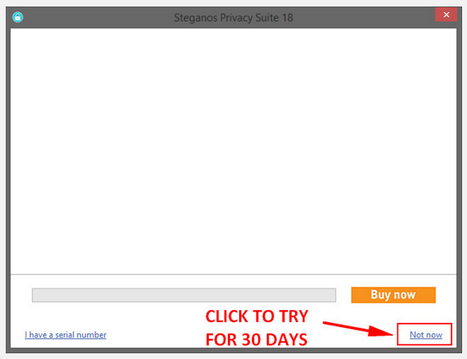 click "Yes", so when you open it next time Steganos Password Manager will fill-in the appropriate password. Click "OK" to start hiding "File to hide_txt_in_image - Copy.txt" inside "1973921.jpeg". A green status bar will be seen as Crypt&Hide performs the operation. When finished the file will be hidden from the interface. 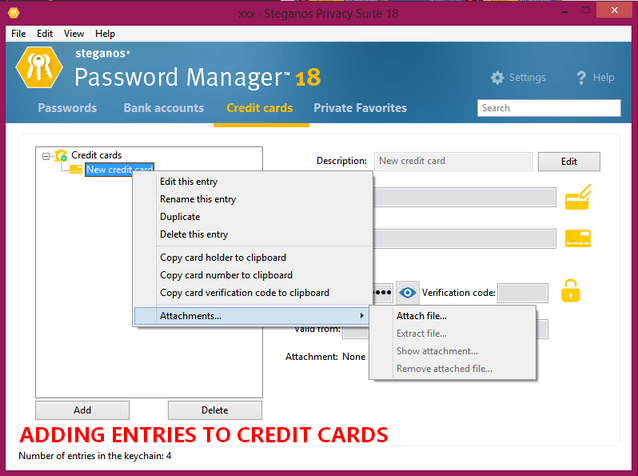 Steganos Password Manager helps you manage all your online passwords, PINs, and other confidential/sensitive data s well as generate secure passwords for you and provides help to enter them automatically when needed. 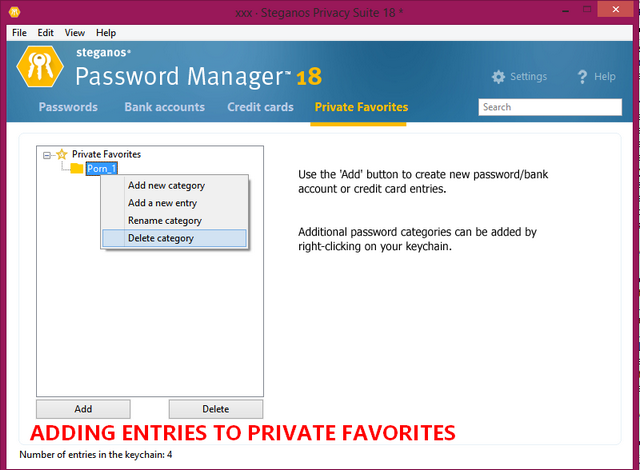 Steganos Password Manager lets you create a "keychain" which I see as a group or a list of password entries for every password that you have. I see it as a way to organize your password from all that you use for any specific need you have. When you create a keychain it will only show the name of the keychain (as in this case, "jasonX_KeyChain"). Along the line and depending on your usage you can further add sub-categories, assign icons and create more entries. For this trial I will just keep it simple as this is also (as mentioned) a first usage (first spin). To create a new keychain, click the Password Manager icon and enter a profile name for your new keychain, say, "jasonX_KeyChain". Creating that profile will automatically make it in the keychain profile list. Click, (in this case) "jasonX_KeyChain", and click "Open keychain". From there you will be asked to enter a password and verify that password in the second password field. Once both passwords have been entered a pop-up will show that your keychain is open and from there you can add entries on that keychain. To add entries to new keychain, click the "Add" button at the bottom left of the window. Fill out the entry fields for: (a) Description - name of your entry, (b) Username -- you or whatever you want to place there, (c) Password, (d) Reminder - if until you should change the password (1, 3, 0r 12 months), (e) Place (URL) where you intend to use that entry, (f) About -- where you can write any info regarding the entry. What you want placed there is all on you so you'd have to think it over and organize those entries so they will be efficient when you use it. 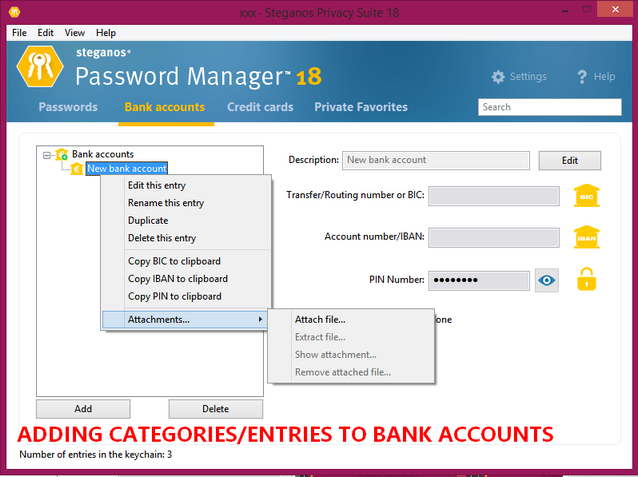 In my trial although I have not placed an entry in the "(e) Place" the Password Manager itself placed an entry when I set the password of this entry be automatically filled for a particular stationary Safe. It field in the file-path or the location of the particular stationary Safe. So that "URL" there is not only intended for any website address "URL:" per se but any location where you intend to use the password set for this entry. The normal intention of this is when you want to "use" the entry password for a particular website address (URL) you'll only have to click the globe icon and from there you can drag and drop the password in that entry. Adding categories, sub-categories, entries to any of the four tabs are pretty self-explanatory and it will depend on the user how he/she will use it or say, tailor-fit it to his/her preferences. See images each four tabs creation tree below. You can either add, edit, rename, delete, move, attach a file. 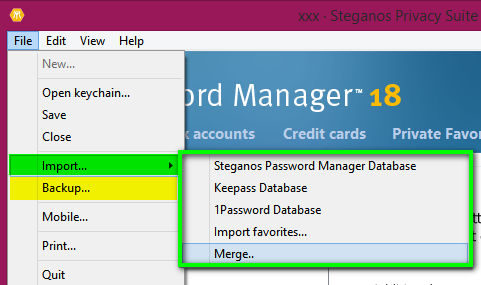 Steganos Password Manager allows you to import an old database from a version later than what you are using. In the menu bar click File>Import and select Steganos Password Manager Database. Select the .esf --for newer version keychains or .sef for older version keychains. Steganos Password Manager allows you to import database from another application. At the moment you can import either database from KeePass or 1Password. In the menu bar click File>Import and select KeePass Database. For this trial since the KeePass database that I imported contained my password for my VeraCrypt Container_1, I then ran VeraCrypt, Drag & Dropped the password from the Steganos Password Manager to the VeraCrypt password field and successfully mounted the VeraCrypt Container_1. See images below. One thing I observed is that importing the KeePass database wasn't exactly that flawless and you still have to edit the imported database entries. I mean the description for a single database was segregated and entered as a single distinct entry. The KeePass Database, "KDBX_1" only has 5 entries. The imported database in Steganos Password Manager keychain had 8 entries in all. For the "imported database entries" to be the same as that of what I want in KeePass, I have to edit it especially that of the description of each entry. See image below. 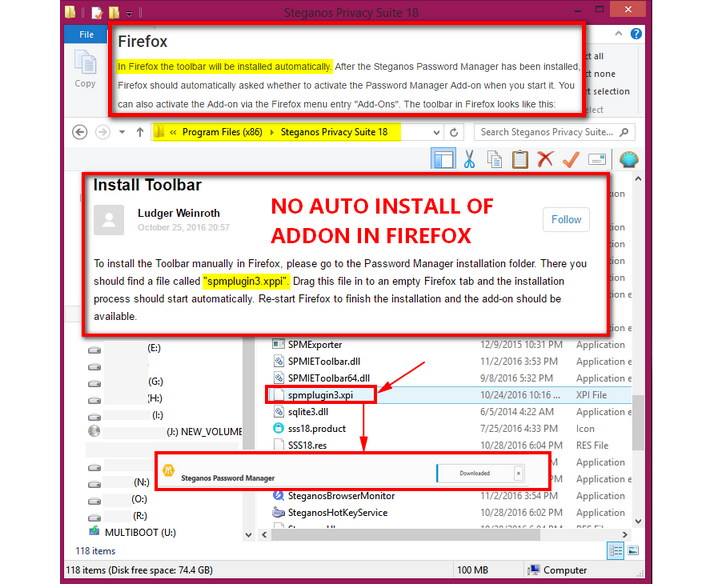 and search the site of Steganos for help in installing the add-on for Firefox. The solution was not easy to find and I had to use "Service" because the help file was of no use. The online help file assumes that it will be installed automatically in Firefox. Kindly see "Observations" on this issue. You can create a portable password manager in a USB stick so you can carry it and use it outside your system. Just go to Settings>Portable Password Manager and point to the file path of your USB stick. Click "Create". 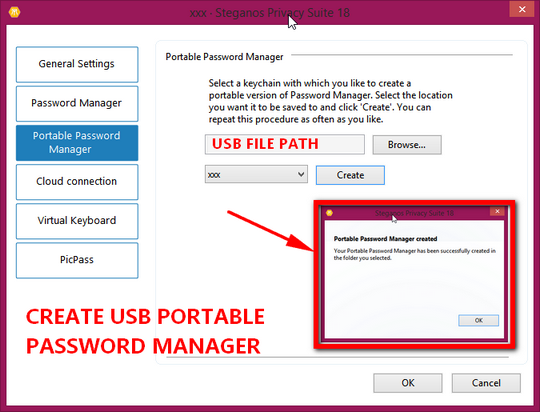 To use it on another PC just plug-in your USB stick and double-click "PasswordManagerPortable.exe". The Password Manager will launch and enter your password to access your keychain. Note that SPS18 only allows one keychain in a portable USB stick. A second keychain will overwrite the first keychain. To circumvent this, you have to create several "PasswordManagerPortable.exe" in separate locations, say, you need to have a portable using 4 keychains. So you create 1 "PasswordManagerPortable.exe" in 4 locations then rename it to say, "PasswordManagerPortable_Keychain1.exe", "PasswordManagerPortable_Keychain2.exe" and so on. Copy those to your USB stick and launch. ant_gamal, omidomi, LowcyGier and 4 others like this. SPS18 allows you to store favorites/bookmarks that you deem "personal" or "private" and encrypts them. It is part of the 4th tab of Password Manager. See Password Manager. Feature is only available in 32bit systems so I was not able to try this one out. Email encryption are used to move emails, contacts, tasks and calendar files from Outlook (or from other supported email programs as applicable) to a Safe where they can be used as normally as possible but with protection of encryption. Only one (1) Safe can be used for mailbox encryption. Steganos Shredder effectively erases data (files/folders) permanently from your hard drive. SPS18 Shredder can also deep erase/deep clean "free-space" on your hard drive too as well as erase data on external devices such as flash drives/USB sticks, external hard disks via it's Device Shredder feature. Note that when you use the "Shredder" files cannot be recovered. They will be permanently erased. Steganos TraceDestructor allows you to remove all traces of information after you have surfed the internet thus those trace build-up that are accumulated when you use the internet (or just use your computer locally) are effectively destroyed. The "One Click Destruction" icon on your desktop allows you to automatically erase all highlighted traces without you having to open SPS18 main interface. You also can automatically destroy all traces after exiting your browser. Go to TraceDestructor>Settings> select "Trace destruction". Place a checkmark on the box next to this option and click "OK". Exceptions can also be made for cookies you want to keep via the "Define Cookie-Exceptions". SPS18 TraceDestructor can also erase additional data from browsers. In chrome there is an advanced setting of clearing browser data>beginning of time but that seems to be incomplete because as you go on again and use your browser there it is "it knows it's you again already". In TraceDestructor go to "Browser" tab where you can find settings for browsers (Firefox, Google Chrome, MS Edge and Internet Explorer). Just select the desired options for your preferred browser (place a checkmark), or just select, "Traces>Select all" from the menu bar to outright remove all traces. Click "Execute now" to finish. Same procedure as with "browser traces" SPS18 TraceDestructor can erase temp file data and recently edited documents from Microsoft Office programs. In TraceDestructor go to "Office" tab where you can find settings for Microsoft Office 2000/XP/2003/2007. Just select the desired options for your Office product (place a checkmark), or just select, "Traces>Select all" from the menu bar to outright remove all traces. Click "Execute now" to finish. Same procedure as with "browser/office traces" SPS18 TraceDestructor can erase temp file data, recycle bin, prefetch data, windows firewall connection protocols and the like. In TraceDestructor go to "Windows-Traces" tab and place a checkmark on the options you want erased or just select, "Traces>Select all" from the menu bar to outright remove all traces. Click "Execute now" to finish. SPS18 allows you to set privacy settings so you are guarded properly/securely. The settings are via toggle switch so you can either "turn-on" or "turn-off": (a) Webcam protection --deactivates your Webcam so others cannot "activate" it without your knowledge, (b) Block Ads --blocks ads/banners paving the way for your websites to load faster, (c) Prevent Tracking --safeguards your surfing habits and disables Facebook and Twitter buttons, widgets, etc, and (d) Anonymize browser type --replaces info about your browser, OS and config so thru it makes it harder to identify your identity online. ant_gamal, omidomi, LowcyGier and 3 others like this. Safe Assistant which is Steganos' step-by-step instructional assistant is good especially to the new user. Single license can be used on 5 PC system. Most developers will only let you use a license for 1 singular PC system SPS18 allows 5! Beat that! Covers wide range of protection tools for the user. The collection of utilities in itself covers all you will need. Very good File Shredder. Personally I think is one of the best shredder application alternative out there. If you are of a different tongue and aren't fluent or well versed with the languages available then you’re in a fix. No built-in help file. All "HELP" is online. No offline User Guide/Manual available. For me who isn't always online trying out Steganos was a bit slow especially when I have to use the HELP files. There are none and all is online. Yeah you'll have to connect to the internet and view the help files in your browser. There is no way of viewing that help file except online. Help files that are online are NOT good either. It also seems outdated in some of the topics there. They are self-explanatory (sometimes) but they lack the necessary images to guide the user on what he will do. Imagine having to understand and tinker with the program and you have no available reference at hand but that online guide with no more than a few images. Imagine a new user (first time user of such a program) having to tinker with it and just rely on the online guide with no more than a few images. He might get confused or impatient and altogether abandon his tinkering. Some sections of the Help file does not elaborate further on some topics like, "Email Encryption" (which is only available in x32 system plus there is nothing stated on "or from other supported email programs as applicable") and "Privacy settings" which when seen when setting it up as well, self-explanatory, but if there are questions like "How is this effectively better than what we can set in Chrome incognito with AdGuard Premium?" See also "SPS18 says, Add-on is automatically installed in Firefox. It is not." below. Email Encryption only available for x32 systems. As plainly put, it is only available in x32 and the Help file again does not elaborate what version of Outlook is covered because it is says there that, Microsoft Outlook 2007 will only be supported in the final version. We are way above the 2007 version now. Backup issue encountered on FAT32 flash drive. 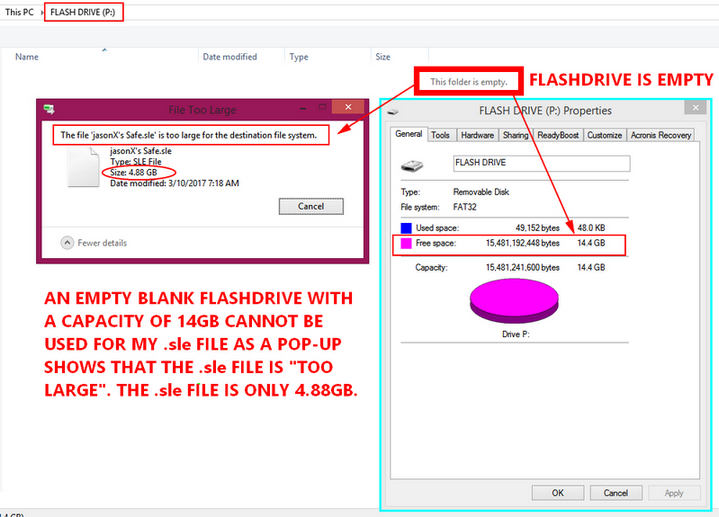 I was planning to copy jasonX's Safe which is 5.12GB to an empty flash drive with 14GB capacity FAT32 file system but was unsuccessful. A pop-up saying "The file jasonX's Safe.sle is too large for the destination file system". See image below. I made a smaller Safe, tagged "jasonX's Safe2" (filename is jasonX's Safe2.sle) which I made lower in capacity at 2.99GB. 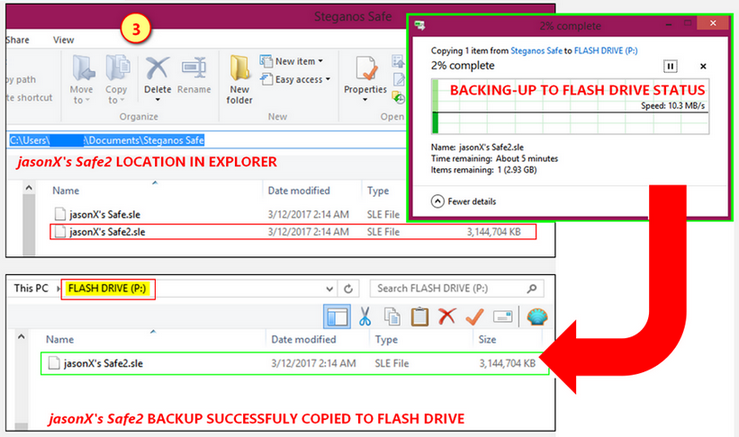 Tried to copy and paste that same Safe to that same empty flash drive (14GB capacity) and it went well. So it seems that SPS18 Safe is limited to a max of 3.2GB (3.144 GB exactly) for FAT32 file system. Help says, "A safe can have a size of up to 2TB (NTFS file system) or 4GB (FAT32 file system)". I beg to differ on FAT32. So if you need to backup a Safe greater than 4GB to a flash drive (say a 32GB FAT32) you will have to change the file system to NTFS first or you will not be able to do so. You will get pop-up with the words "The file xxxxxxxx.sle is too large for the destination file system". It would be nice "if" >4GB can be accommodated for FAT32 as USB/lash drives are now at 32GB going to 64GB. No means of viewing entered password if incorrect or not. In my trial/review of SPS18 I have always been bugged by the "incorrect password" pop-up! I mean it was a bit annoying as I am using a copy/paste method from a file I made specifically for this trial/review. Never had that issue when I was using that method with VeraCrypt/AES Crypt and TheVault. This is a "first" as I am ALWAYS EXTRA CAREFUL of selecting/copying and pasting from my secure file to ANY password field. Had to exit and restart SPS18 and I had to "delete" the Created Safe (stationary and Portable Safe) to start anew. 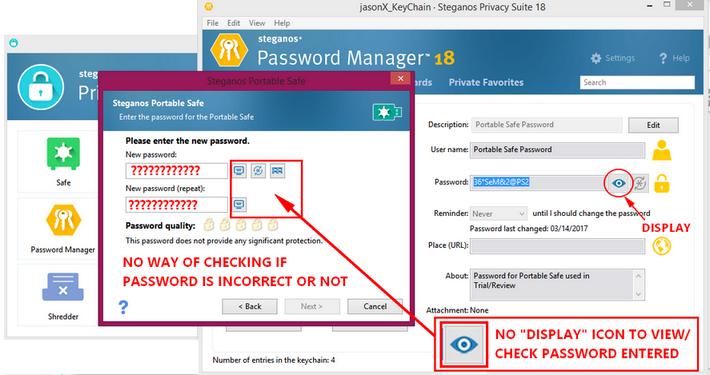 To check if there is really some bug I am encountering while I was doing this trial/review I used it's own Steganos Password Manager. I made a Keychain and entered the details as seen in the images below. Used that to apply the passwords that is required on each Safe I created via the drag/drop feature. This time when I used the Password Manager with the KeyChain I created. All went well and there was no instances of "incorrect password". Then it hit me, as you drag/drop the password in the password field it just shows hidden asterisk characters re:-- "........." So there will be no means of viewing/checking if the password that was drag/dropped or (even copy or pasted) is correct. So you are left to the mercy of the program if he reads it correct or not. Now that was the thing that annoyed me. As mentioned previously "I am ALWAYS EXTRA CAREFUL of selecting/copying and pasting from my secure file to ANY password field". Now with that password "hidden" even if it is either drag/dropped or typed or copy/pasted there is no means if REALLY the password reflected there is correct or not. I wanted to "catch" if SPS18's incorrect password pop-up's are correct or not but I was not successful at it. See images below. Crypt&Hide_Hide a file inside an audio file error. As mentioned in "Hide a file inside an image/audio file", I encountered an error while it's decryption. Opening the .edf file (carrier file-Steganos Encrypted File) gave an "incorrect password" even though it was auto-filled-in by Steganos Password Manager. All the prerequisites have been followed especially that of the files size and the file type consideration. The image file used is only 35KB and the carrier file which is an audio, "Rod_Stewart_i'll be seeing you.wav" is at 39873KB. I had set Steganos Password Manager to supply-automatically the password for this archive. 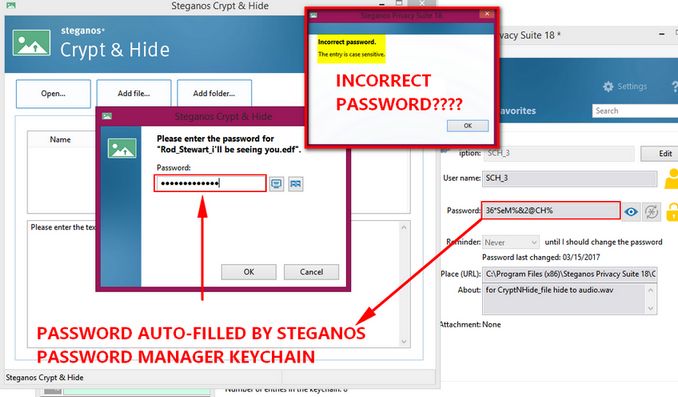 Drag&Drop the password during its creation and then opted to click "Yes" -- to allow Steganos Password Manager to fill-in the password automatically. The password as you will see in the image and GIF shows the correct password "displayed" which is "36*SeM%&[email protected]%". When I attempted to open the .edf file -- Rod_Stewart_i'll be seeing you.edf, Steganos Password Manager automatically supplied the said password but Crypt&Hide says it's INCORRECT. Further attempts to open the "Rod_Stewart_i'll be seeing you.edf" (even careful copy/paste from a text file) failed also. Tried another image file 33.jpg (220KB) and carrier file --Bread_Lost without your love.wav (30041KB). But the same "phenomenon" occurred ---"incorrect password". This might have been some bug with the password reader as previously I was plagued with an "incorrect password" error when I started creating a Safe. 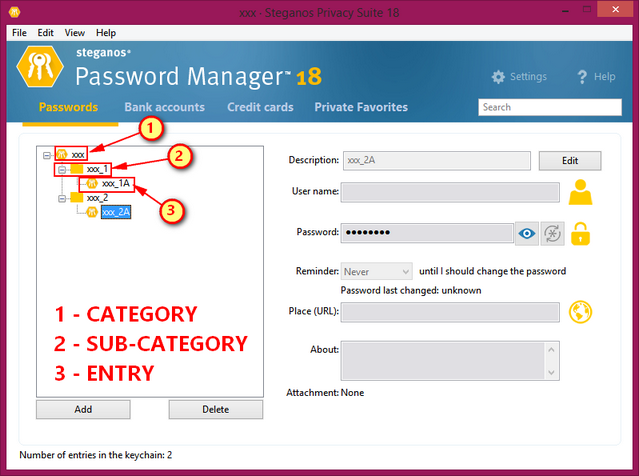 Thus I used the built-in Steganos Password Manager to supply the passwords automatically. Tried a text file, File to hide in audio.txt (1KB) and carrier file --Bread_Lost without your love.wav (30041KB). Same thing happened! Incorrect password! 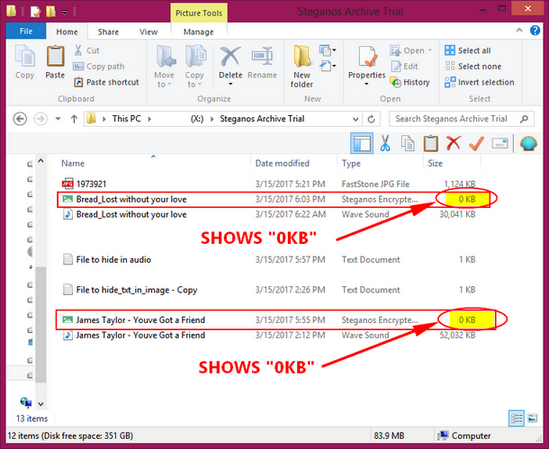 Tried a text file, File to hide in audio - Copy.txt (1KB) and carrier file --James Taylor - You've Got a Friend.wav (52032KB). Same thing happened! Incorrect password! Looking closer on the .edf file that Crypt&Hide creates to hide files inside an audio/video file, both file archives created is 0KB! See image below. Crypt&Hide (when a file is hidden in an image file-carrier file and need to open/access that hidden file inside the carrier image file), you will need to open the "carrier file" itself. Crypt&Hide does not create an .edf file for that. That is what I see the difference when you use an image file as carrier file instead of an audio file. So just to check something out, I attempted to open the carrier-audio file instead of the .edf file. Attempting to open both audio file showed an error. See image below. So that's about it for a file to be hidden inside an audio file. Never got to make it work. This issue needs further tinkering in the future. I feel I am not doing it correctly but hey, there is no guide for a new user available. I did not have the time to send support a ticket for this one. Let it be note that as mentioned we cannot VERIFY the correctness of the password entered in the password field. There is no means there to see/verify the password entered/supplied either by typing it, copy/paste and even via Steganos Password Manager's drag/drop and auto-fill WITHOUT the "DISPLAY" icon. It shows as "hidden" in the password field. To show comparison to other applications, I used VeraCrypt (open a container) and KeePass (open a KeePass file --master password). Both window containing the password field has a means to "display" the password prior opening. See image below. omidomi, LowcyGier and wwd like this. When you browse for the video file to be used as a carrier file, the given file types DOES NOT include .wmv. See image below. SPS18 says, Add-on is automatically installed in Firefox. It is not. The online "Help" file says that specifically, that in Firefox it is installed automatically. I had to search the Steganos website to check and see what I can do because just typing "Steganos Password Manager Firefox add-on" in Google will not get you anything. I came about an solution to manually install it I have to go to the SPS18 installation folder and drag the file "spmplugin3.xppi" in Firefox to start it automatically. I did drag that file (spmplugin3.xpi and NOT spmplugin3.xppi) it took a long time downloading it in an average connection. (On a good day I can download 120mb in 45min). Steganos online "Help file" seems not updated and there are some wrong entries there also. The lack of images there does not help also. Steganos Privacy Suite 18 (SPS18) is a great suite of tools designed specifically to keep data you deem as "sensitive/confidential" safe from unauthorized access and exposure. The individual user protected with its state-of-the art 384-bit AES-XES encryption with AES-Ni Hardware acceleration. The "Safe", "Password Manager" and "File Shredder" (which I think are its strong-points) is superb in doing its job of protecting your data and privacy. 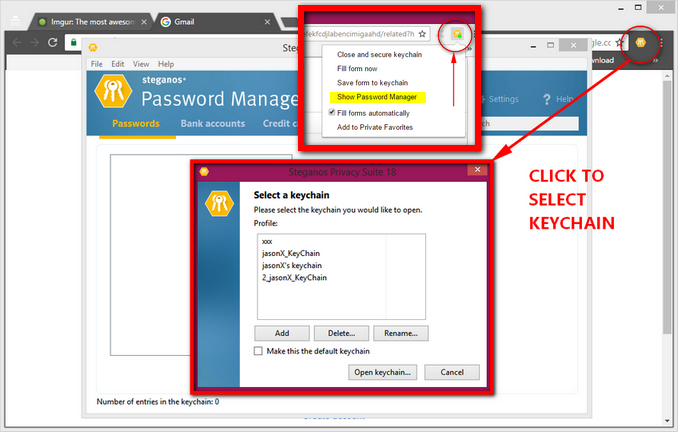 One thing to be noted that you will still have to "keep safe on your own" the passwords for the Password Manager itself as before you can use it you will have to enter the keychain password "outside" the Password Manager's protection. This is also the same with other password managers around in the market. There were times, as mentioned, in this review that I encountered "incorrect password" often even when it is auto-filled by the Password Manager itself. It seems to be a fluke/bug in the Password Manager itself but I could not verify that with the absence of a "display" button to counter-check if the passwords auto-filled or drag & dropped to the password fields are correct or not. In contrast, as mentioned also in "Observations", both KeePass and VeraCrypt have means to display passwords (as mentioned I use this to verify "if" passwords I enter manually, copy/paste from a file, drag and drop from another application or auto-filled by another application are correct). The Crypt & Hide which at first seemed flawless did in fact left me wondering how I can make hiding a file in an audio-carrier file work out. I never really got beyond that and just plain gave up. If that worked out then I'll be happy to state that Crypt & Hide is one of SPS18's strong-points but then again due to this I just zipped it. It would be nice if Email Encryption will be available for x64 systems also and along this line not only MS Outlook. Never got to try that out as I do not have a x32 system. A standalone user guide or manual will go a long way but, may I say, that an "offline Help File" built-in the program itself should be a "standard" as a quick lookup is inevitable. An online-Help File is okay but every developer has a responsibility to make it user-friendly because in the end it is not only the "learned" or one who is "profoundly knowledgeable" of these applications that aims to use them but also newbies. It is in fact the needy-newcomer who is the target of any application developer. There are less than a handful of images in the online-Help file and it is "not" very helpful. Both standalone user guide/manual and online/offline Help File should (always) be updated or in the very least amended from time to time. Even searching the net and glancing/reading on reviews about Steganos Privacy Suite 18 (SPS18) posted on blogs and the like, did not even give me the information I need on some topics and issues encountered. Most of them (not all) were in fact "not" a full review (as writers have claimed) but rather a mere "overview" of SPS18. (Full Review -- Short Review --Overview-- isn't the same as "tomato -- tu'mey-tow[N.America], tu'maa-tow[UK]"). 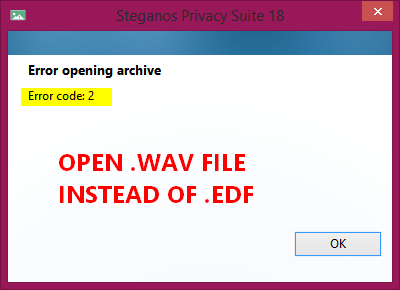 In comparison to a handful of applications I normally/usually use for encryption and protection I'd say the Steganos Privacy Suite 18 has an edge because of its collection of very useful utilities. A suite with all the tools, is and always, best for me in comparison to using 3-5 applications. I use AxCrypt/7Zip for encrypting email attachments. 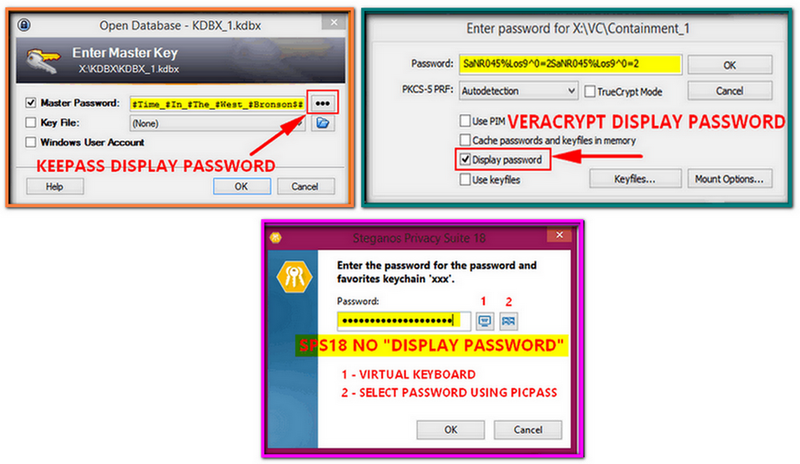 I use VeraCrypt in replacement of TrueCrypt for encrypted containers. KeePass /Roboform (rarely) for passwords and some other tools that need not be mentioned. All of them kept me safe and satisfied in all my digital years. All of "them" with regular backups that are reliable. Having one suite to provide all the functionality you need is efficient and keeps everything simple as long as they (all utilities/components) function and complement each efficiently. The issues and problems that I encountered definitely deserve a second look and perhaps when I have the time in the future I will send Steganos support a ticket about all of them and perhaps (again if I have the time) amend this review. I would not mind having Steganos Privacy Suite 18 with me anytime. 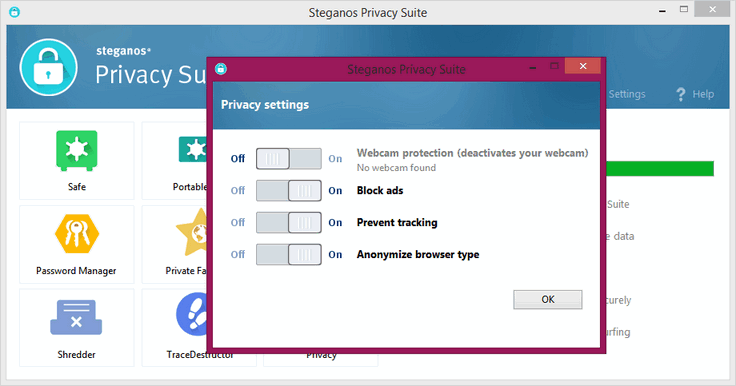 The latest version is Steganos Privacy Suite is version 18.0.2.0. The unlocked safe seamlessly integrates itself in Windows as a disk drive and can be used from within any application. Microsoft Windows 10, 8 or 7; at least 1 GB RAM (x32 / x63 bit) CD/DVD-ROM drive, 200 MB of storage space, internet connection for updates, Steganos Mobile Privacy iOS and Android apps are available for free in the App Store or Google Play store. For Steganos Safe, additional storage space is required for the secure drives. The NTFS file system is required for secure drives larger than 4GB. Supported key devices; All devices that Windows recognizes as writable removable media (e.g. USB sticks, memory cards, digital cameras), Key devices not included in delivery. Functionality restriction: No mailbox encryption for x64 bit operating system. omidomi, aviator365, Infinity and 5 others like this. ant_gamal, LowcyGier and wwd like this. LowcyGier and RGiskardR like this. LowcyGier and wwd like this. wwd, LowcyGier and RGiskardR like this.